Wednesday marks 14 years since a massive 9.1-magnitude earthquake shook the floor of the Indian Ocean and sent killer waves towards the shores of multiple countries, killing more than 227,000 people and causing some $10 billion in property damage. But for people living along the Java and Sumatra coasts in Indonesia, there's little time to pause to commemorate the grim anniversary. Instead, they are bracing for a possible repeat of the tsunami that struck last Saturday and killed at least 430 people and displaced 22,000. 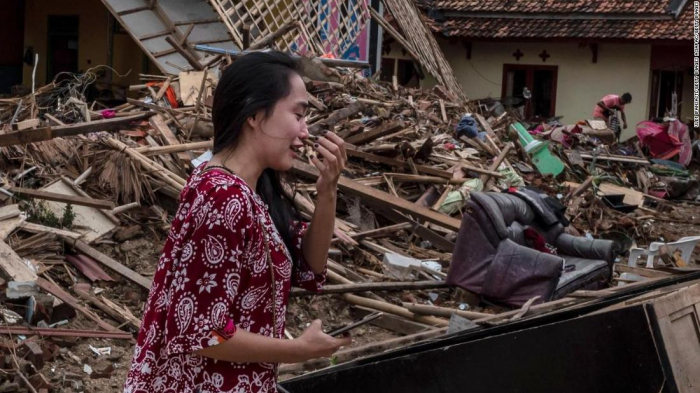 That disaster came after another tsunami and earthquake struck western Sulawesi in September, killing more than 2,000 people. The 2004 Indian Ocean tsunami was to have ushered in a new era of disaster preparedness in countries such as Indonesia, which alone lost more than 100,000 people -- more than any other of the 13 countries affected. In what has been called a "Build Back Better" approach, authorities in the affected countries pledged to introduce measures to reduce death and destruction from future natural disasters -- including building safer schools and hospitals, moving communities away from vulnerable coastlines, training people in delivering basic first aid and installing early warning systems. In Vietnam, the government even plans to integrate disaster education into the national school curriculum. But promising to install infrastructure that helps save lives is one thing; making sure it works during actual emergencies is another. In the aftermath of the double-barrelled disasters in Indonesia, it has been reported that a network of detection devices, donated by foreign countries after the 2004 tsunami and which might have helped saved more lives, was not fully operational or not robust enough to withstand the forces of nature. Tsunami detection buoys reportedly stopped working in 2012 and, in the September tsunami event, cell phone towers that were used to transmit warning text messages were toppled by the shaking. Indonesian President Joko Widodo, who faces an election next year, has ordered the procurement of tsunami detectors "that can provide early warnings to the community." Dwikorita Karnawati, of the country's Meteorology, Climatology and Geological Agency, told me that her agency had been aware since April that there was a need to improve its existing tsunami warning system. She said that by using oceanic bottom sensors connected to a smart cable network, officials would be able to detect both tectonic and nontectonic induced tsunamis. "Actually, we are now in the process of preparing the system improvement." Sometimes these detectors can only provide a few seconds of warning. But even a few seconds, paired with teaching people how to recognize a tsunami and where to flee, can make a difference. International lenders, who signed off on $6.5 billion of loans to Indonesia in 2018, also have a role to play. They can pressure the country to implement risk reduction into its development agenda and make measurable progress contingent on future funding. The fact that the donated warning buoys haven't been working for the past six years is disgraceful. Furthermore, in order to reduce disaster risk from natural events, vulnerable countries such as Indonesia (which has 13% of the world's volcanoes) need to go far beyond early warning systems -- and that means putting into place measures on the ground to not only save lives and property but also to facilitate a rapid response. Given Indonesia's history with volcanic hazards and tsunamis, the country's officials should have done more to implement quality risk reduction -- such as moving people away from vulnerable coastlines. And that has prompted Sutopo Purwo Nugroho, head of the Data Information Center and Public Relations of the National Disaster Management Agency, to speak out for "spatial planning" that places buildings a safe distance from shorelines, and for more strict building codes. "It does not mean that disaster-prone areas should not be built (up) at all. It may be built, but there are provisions," Nugroho said. But there seems to be promising news for Indonesia. The country's Red Cross, which is leading the relief effort following Saturday's disaster, had personnel and pre-positioned supplies in place to treat victims quickly. UN officials tell me the Indonesian Government did not feel the need to issue a call for international assistance. The Red Cross operation aims to assist an initial 7,000 people (approximately 1,400 households) affected by the event, with relief assistance such as tarpaulins and hygiene kits, health and psychosocial support, water, sanitation and hygiene support and evacuation and search and rescue support. At least 58,000 people have been impacted by Saturday's tsunami in one way or another, as of December 25. The Red Cross says work has been underway for months to reduce reliance on outside help. The preparations have been impressive and include measures ranging from training people in vulnerable regions to administer first aid and installing robust emergency communications systems to pre-positioning emergency supplies such as tarpaulins and blankets. Indonesia has "significant capacity" for providing humanitarian assistance, said Jen Clancy, humanitarian and human rights advisor at the Australian Council for International Development. "Natural disasters aren't a new phenomenon for Indonesia, unfortunately. ... They are well experienced in responding to natural disasters." Being able to better rebuild communities after disasters also means boosting local capacity so that international aid agencies -- many of which are currently over-stretched by multiple and simultaneous man-made and natural disasters -- don't have to be tapped for assistance. Those of us who have worked many disasters know well that local relief agencies have a far better grasp of the local operating environment and lay of the land. And in countries such as Myanmar, where we faced huge challenges delivering aid to the 3.4 million survivors of Cyclone Nargis in 2008, local nongovernment organizations and Red Cross societies know how to navigate around bureaucratic bottlenecks and prevent diversion of aid to greedy generals. On Wednesday, of all days, when our thoughts and prayers are with the families of the victims of the monster tsunami 14 years ago, there is no excuse for governments to ignore available and proven technology and practices that could help reduce mortality from natural disasters. Michael Bociurkiw is a global affairs analyst and a former reporter for the South China Sunday Morning Post and Asia Times. The opinions expressed in this commentary are his.